Description: Designed with bold geometric styling, this Quadrato pendant features an elongated rectangular profile that provides the perfect lighting design to illuminate and enhance the aesthetics of transitional and contemporary settings. An architecturally designed frame featured in an Oil Rubbed Bronze finish embraces the Eggshell Textrene shade. 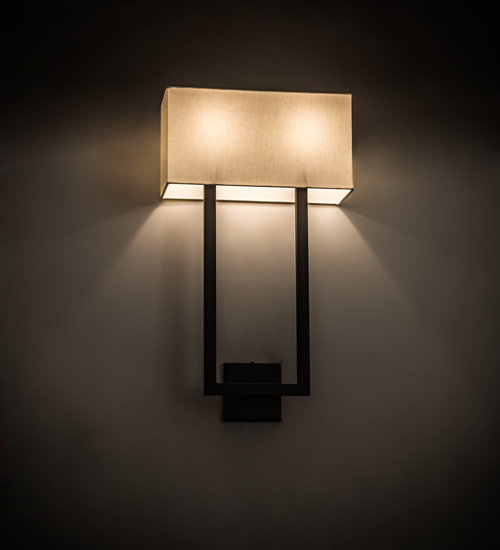 The wall fixture is ideal for corridors and other rooms in residential, hospitality and commercial settings. Custom crafted in the USA. Custom styles, colors, sizes and dimmable energy efficient lamping options are available. UL and cUL listed for dry and damp locations, however, we do not recommend installing it in spaces that experience a large amount of moisture due to the fabric shade.